Two of Australia’s early music ensembles combine to perform repertoire about which they are passionate: music for viola da gamba by Marin Marais and the cantigas de Amigo of the 13th century Galician composer Martin Codax. 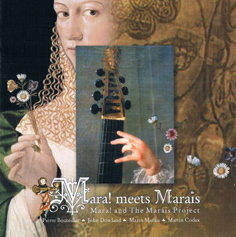 Both ensembles take a broad approach to this music of the past: Marais wrote many works for seven-string viola da gamba and continuo – a second bass viol with either theorbo or harpsichord; the Codax cycle survives, as does virtually all of the song repertoire of the 13th century, as a single melodic line – the instrumental accompaniment must be reconstructed from contemporary iconography, the little we can gleam of performance practice from written sources and the performer’s informed imagination. The notes acknowledge the anachronism of the use of the modern double-bass, the renaissance lute, bouzouki and gittern: “The aim of the collaboration was to push beyond the boundaries rather than be circumscribed by them”. I have no quibble with this. The suites of Marin Marais, the foundation of the Marais Project, are for the viola da gamba what Bach’s six suites for unaccompanied cello are for Baroque music: they represent the high point of French 17th century achievement for any solo instrument, on a par with Couperin’s harpsichord works. The F major suite is performed very elegantly by Jennifer Eriksson. Unfortunately it is masked by a too dominant continuo line. As the accompanying notes make clear, this was not a studio recording under ideal conditions and perhaps further adjustments were needed by the recording engineer. Mara Kiek’s extraordinary voice seems well suited to the Codax songs, tinged with plangent melancholy. No music survives for the sixth of the songs, so I was particularly interested to hear what Mara! have done with it. La Romanesca’s recording from the 1980s borrows a contemporary cantiga and the current recording takes the same sensible approach. The instrumental arrangements owe much to the post-Munrow, post-Runnymede style, mixing period instruments with modern, varying the instrumentation between solo passages (with some very fine double-bass playing) and “big band” sound. This is a very enjoyable “post-authentic” reading of some great music: its authenticity can be neither confirmed nor denied.